At Kogel Bearings we spend a lot of time looking at one particular part of the bicycle: the bottom bracket. We tend to nerd out over the smallest possible details. With my personal history in product development for fashion companies, the discussions about bearing types and insert depth are not unsimilar to the discussions I used to have about raising a collar height by two millimeters. As with many things in life, the devil is in the details. In this blog post we will try to give you the tools to determine what makes a good bottom bracket and what makes the best bottom bracket for your bike. Threaded, press fit or threaded press fit? When it comes to bottom brackets, traditionally there have been two types: those that thread into the frame and those that press into the frame. Your frame will determine which one you will need. A few years ago, a third option was introduced. What we like to call the ‘threaded press fit’ bottom bracket. Basically this is a press fit bottom bracket where the two shells thread together in the center. Threaded or Pressfit is determined by your frame. Threaded cups are stable and relatively problem free. The downside of this is that it is only possible in metal frames or carbon frames with a metal bottom bracket shell. A traditional threaded bottom bracket by Shimano. With frame makers looking to build the lightest possible frames, press fit bottom brackets are most popular on higher-end bicycles. The frame has a hollow sleeve which is made with high precision to accept bottom bracket cups. The bottom bracket is pressed in with specific tools. ‘Precision’ is the key word in that sentence. Cups and frame need to match together within 1/20th of a millimeter. Too loose and the cups will fall out of the frame, too tight and the bearings will seize up or the frame could even crack during installation. The idea behind the threaded press fit is to securely lock the two press fit cups together to avoid creaking issues and increase stability. At Kogel Bearings we believe that this type of set up puts stresses on the frame in a direction that it was not designed for. Most brands use rubber O-rings in their construction to compensate for tolerances in the BB shell. Some require a lot of torque on the installation tool to fix the bottom bracket in the shell. What is the best solution here? It depends on your bike. We believe in press fit solutions for press fit problems. All Kogel bottom brackets are designed to maximize the contact area between the frame and cup to ensure a proper seating of the bottom bracket. If your frame happens to be on the large side of the BB shell tolerance and suffers from constant creaking, a threaded press fit might be able to lock the bearing cups laterally. A threaded bottom bracket is generally seen as the trouble free solution, but it requires a metal insert in the frame (which in itself is prone to creaking if glued in a carbon frame) and limits the cranks that can be used. 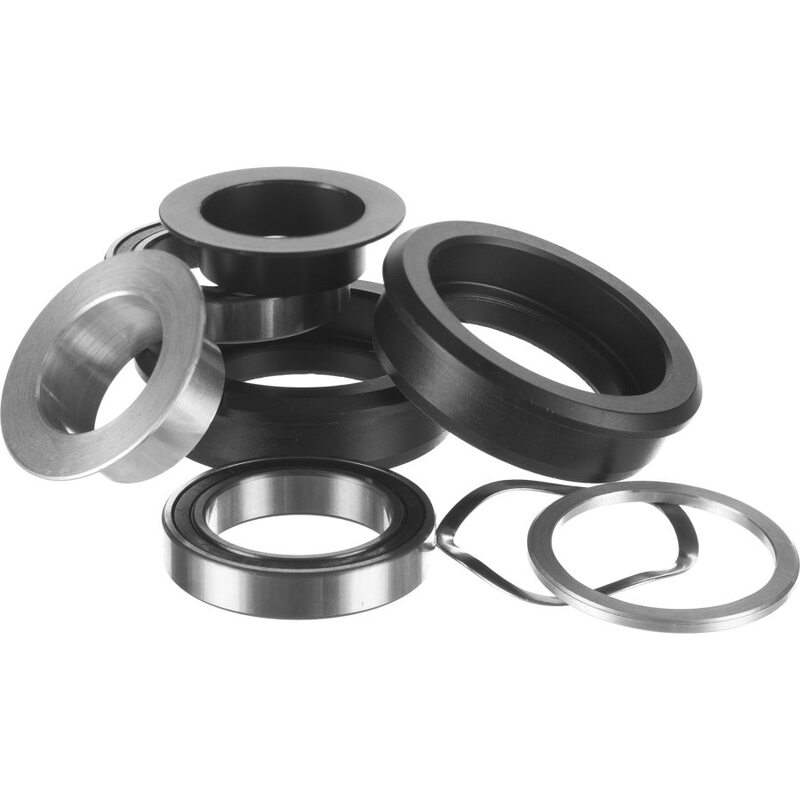 At Kogel Bearings we realize that lots of bottom brackets have issues with creaking, popping and knocking. One way to stop this is starting from quality materials. As a general rule, aluminum is better than plastic, since aluminum can be produced to much tighter tolerances and will be better at retaining it’s shape over hundreds of thousands of crank revolutions. Stacking spacers and adapters on top of each other, just to make things fit, is not helping the situation. In order to avoid unwanted sounds, we design all bottom brackets with as few parts as possible. One press location on each cup, one contact point per cup for the crank spindle. By reducing the amount of parts, we avoid possible locations to develop play or gather dirt. Stashing a pile of spacers, washers and adapters on top of eachother, just to make things fit, is never the best solution. In Part 2 of this blog we will address bearing stance, installation and try to come to a conclusion. Stay tuned to our ball bearing adventures. If you have any questions about Kogel Bearings, ball bearings in general or our Ball Bearing Adventures, please ask them either in the comments section below, one of our social media channels or by email via info@kogel.cc. We will answer them in a highly professional, but not always scientific way. We do not shy away from many subjects. Please ask, we are here to answer.